What: The southwest Montana project aims to characterize the protoliths, the grade and timing of metamorphism, and the intensity and nature of tectonism of metasupracrustal rocks that occur along the western flank of the Ruby Range, and to integrate these findings into our developing understanding of the 1.8-1.7 Ga Big Sky orogeny, an arc-continent collision that occurred along the northern flank of the Wyoming province during the growth and consolidation of ancestral North America. Where: The Ruby Range project will start and end in Missoula, Montana, but our fieldwork will be conducted out of a base either in Dillon or Twin Bridges, Montana – two small communities located on the periphery of the Ruby Range. The field area is 160 km west of Yellowstone National Park and 100 km south of Butte, Montana. In a singular, remarkable, and enigmatic phase of earth history, the period from approximately 2.0 to 1.7 Ga saw the amalgamation of Archean cratons into the stable core of ancestral North America (Hoffman, 1988). This finalized the transition from processes that operated in the earth’s infancy (4.0 to 2.5 Ga) to the plate tectonic mechanisms of earth dynamics we understand operate today. A half-dozen cratons – one of which is the Wyoming province – were welded together across collision zones. Rocks of the Wyoming province are exposed today as a result of the creation of the Rocky Mountains in the last 0.65 Ga, when crustal-scale faults uplifted the older and long-inactive continental basement. Erosional removal of overlying younger rocks in the cores of these ranges affords us a glimpse into this geologic past, if only in isolated, discontinuous outcrop areas. 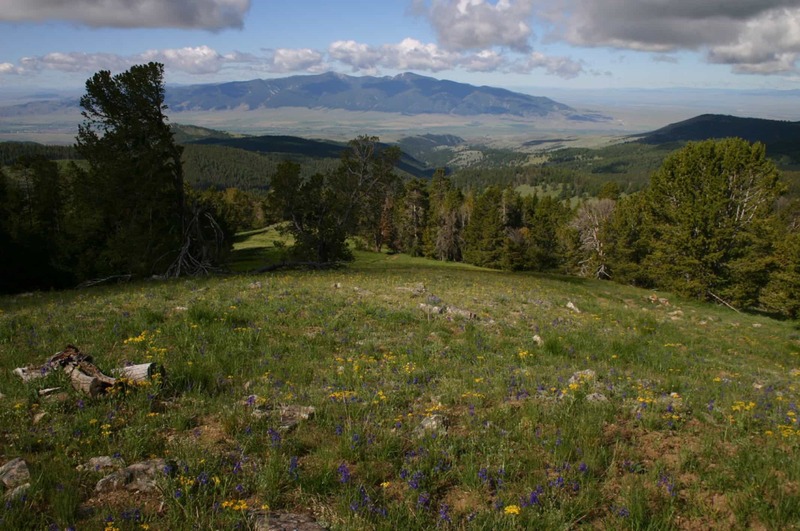 Previous Keck Consortium projects involving some 35 undergraduate students studied the Precambrian geology of the Tobacco Root Mountains of SW Montana, which lie on the NW flank of the Wyoming province. A well-constrained metamorphic P-T-t path and deformation sequence for the climax Precambrian tectonic event in the Tobacco Root Mountains demonstrates that a Middle Proterozoic (1.8-1.7 Ga) orogeny, dubbed the Big Sky orogeny, generated crustal thicknesses, structural styles, and metamorphic grades consistent with either an arc-continent or continent-continent collision during the final amalgamation of the Wyoming province into ancestral North America (Brady et al., 2004; Cheney et al., 2004; Harms et al., 2004). 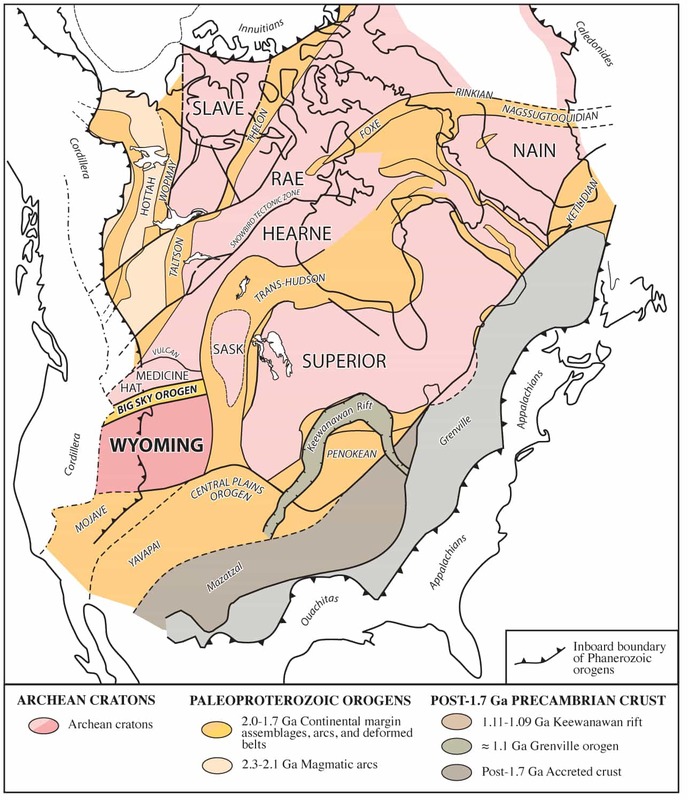 Ancient cratons (pink) and intervening 2.0-1.7 Ga orogenic belts (gold) of ancestral North America, including the Wyoming province and the Big Sky orogeny. Adapted from Hoffman(1988) and Bleeker & Hall (2007). The Ruby Range lies immediately to the southwest of the Tobacco Root Mountains and represents another piece in the Big Sky puzzle. Previous geochronological and thermobarometric studies demonstrate that medium to high-grade metamorphism affected rocks of the Ruby Range during the Big Sky orogeny (Alcock et al., 2013; Alcock and Muller, 2012; Cramer et al., 2013; Jones, 2008; Roberts et al., 2002). Nevertheless, important questions remain to be addressed. What structural level in the orogen do rocks of the Ruby Range represent? Did deformation migrate along or across the orogen through space and/or time? What was the vergence of the collision? In what tectonic setting did the protoliths of the Ruby Range rocks originate and how did they become incorporated in the orogen? Metasupracrustal rocks (pelitic schists, quartzite, iron formation, amphibolite, and marble) that occur along the western flank of the range are well suited to address these questions. Precambrian basement rock exposures (grey) of the Wyoming province. A. The Archean core of the Wyoming province (pink) is flanked by 2.0-1.7 Ga suture zones (gold): Trans-Hudson orogen, Cheyenne Belt, and Big Ski orogen. B. Laramide ranges that expose Precambrian rocks in southwest Montana. The Ruby Range is highlighted in gold. Dillon (D) and Twin Bridges (TB) located at stars. Deformation history as expressed by fabric relations and fold generations. In the field, students will gain experience with mapping and sampling techniques and with rock, mineral, and structure identification and description. Students will develop the necessary expertise to plan and direct their own traverses. Working conditions: Daily traverses will be largely off-road and off-trail on open range land or in BLM forests. Each day we will drive unpaved roads as close to our target rocks as possible – but most days will include a hike of 2 or more kilometers and/or a change in elevation of 1000 feet. We will typically be working at some distance from a vehicle or cell phone service, but never alone. We could encounter antelope, elk, and coyotes, as well as bears, rattlesnakes, and ticks. Summer weather in Montana is usually sunny and dry. Temperatures depend on elevation, however, and can range from 95+ to 45 degrees. Students should be prepared for the potential of strenuous hiking on steep terrain and extended periods of the day in the hot sun without shade. As in all arid environments, dehydration and heat exhaustion are possible. Afternoon thunderstorms are also common. Exercising sensible precautions, good judgment, and appropriate respect will minimize the danger from such experiences and maximize the rewards of working in the Rocky Mountains. Having appropriate field gear is also a critical component of a safe work environment. Therefore students should bring refillable water bottles, sunblock, and light-weight clothing (e.g. long-sleeve shirts, loose pants, a wide-brim hat, and sunglasses). Sturdy over-the-ankle hiking boots are a must. A day pack to carry all this, plus rock samples, is also necessary. Our base of operation will be a house-like setting where students will bunk in several shared bedrooms and will share a bathroom. Full kitchen facilities will allow us to provide our own meals each day. We may also choose to camp overnight in the field area from time to time, if this is deemed most efficient. In that case, we would be dry camping, without refrigeration or electricity, and with only the water we carry in. Recommended Courses/Prerequisites: Structural Geology and a course in Petrology that includes Metamorphic Petrology are necessary prerequisites for participation in this project. Experience at a field camp or in a field geology course is strongly recommended but not required. Work from this project must carry over into the senior year (2014-15) as a senior thesis (or equivalent) carrying course credit. Alcock, J., Mueller, P.D., and Jercinovic, M.J., 2013, Monazite ages and pressure-temperature-time paths from anatctites in the southern Ruby Range, Montana, USA: evidence for delamination, ultramafic magmatism, and rapid uplift at ca. 1780 Ma: Canadian Journal of Earth Science, v. 50, p. 1069-1084. Alcock, J., and Muller, P., 2012, A Paleoproterozoic sedimentary basin within the Wyoming craton exposed in the Ruby Range, SW Montana: Identified by field relations and geochronology: Northwest Geology, v. 41, p. 47-62. Bleeker, W., and Hall, B., 2007, The Slave Craton: Geology and metallogenic evolution, in Goodfellow, W.D., ed., Mineral Deposits of Canada: A Synthesis of Major Deposit-Types, District Metallogeny, the Evolution of Geological Provinces, and Exploration Methods: Geological Association of Canada, Mineral Deposits Division, Special Publication No. 5, p. 849-879. Brady, J.B., Burger, H.R., Cheney, J.T., and Harms, T.A., editors., 2004, Precambrian Geology of the Tobacco Root Mountains, Montana: Geological Society of America Special Paper 377, 256 pp. Cheney, J.T., and 17 others, 2004, Proterozoic metamorphism of the Tobacco Root Mountains, Montana, in Brady, J.B., Burger, H.R., Cheney, J.T., and Harms, T.A., eds., Precambrian Geology of the Tobacco Root Mountains, Montana: Geological Society of America Special Paper 377, p. 105-129. Cramer, M.A., Voarino, B., and Baldwin, J.A., 2013, Metamorphic evolution of Precambrian basement in the southern Ruby Range, SW Montana: Geological Society of America Abstracts with Programs, v. 45, p. 601. Jones, C. L., 2008, U-Pb geochronology of monazite and zircon in Precambrian metamorphic rocks from the Ruby Range, SW Montana: Deciphering geologic events that shaped the NW Wyoming province: Unpublished MSc thesis, Kent State University, 131 pp. Harms, T.A., Brady, J.B., Burger, H.R, and Cheney, J.T., 2004, Advances in the geology of the Tobacco Root Mountains, Montana, and their implications for the history of the northern Wyoming Province, in Brady, J.B., Burger, H.R., Cheney, J.T., and Harms, T.A., eds., Precambrian Geology of the Tobacco Root Mountains, Montana: Geological Society of America Special Paper 377, p. 227-243. Hoffman, P., 1988, United Plates of America, the birth of a craton: Early Proterozoic assembly and growth of Laurentia: Annual Review of Earth and Planetary Science, v. 16, p. 543-603. James, H.L., 1990, Precambrian geology and bedded iron deposits of the southwestern Ruby Range, Montana: U.S.Geological Survey Professional Paper 1495, 39 pp. 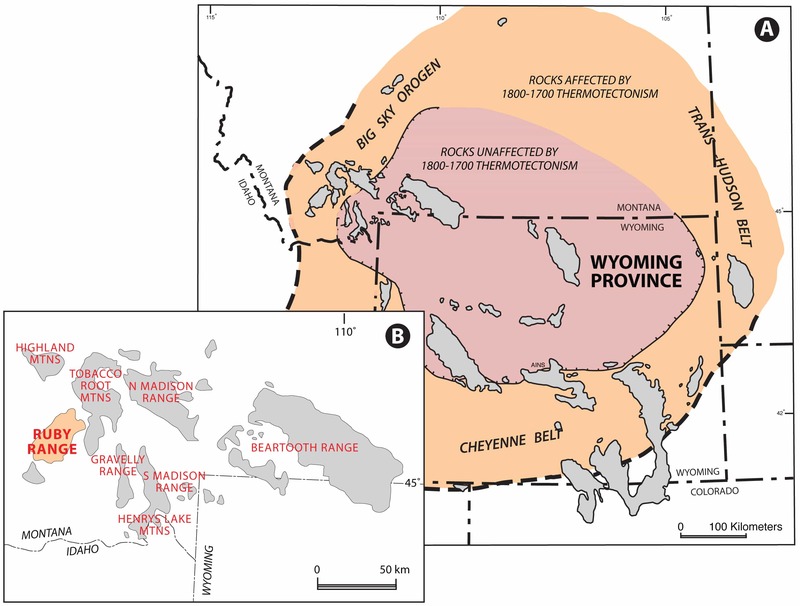 Roberts, H., Dahl, P., Kelly, S., and Frei, R., 2002, New 207Pb-206Pb and 40Ar-39Ar ages from SW Montana, USA: Constraints on the Proterozoic and Archean tectonic and depositional history of the Wyoming Province: Precambrian Research, v. 117, p. 119-143.